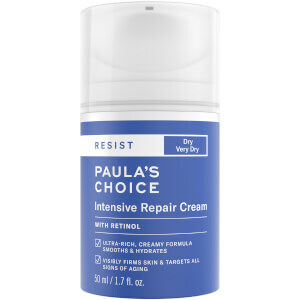 Catering specifically for dry skin, the Paula's Choice RESIST Skin Restoring Moisturizer SPF 50 works to hydrate, protect and restore long-lasting comfort. 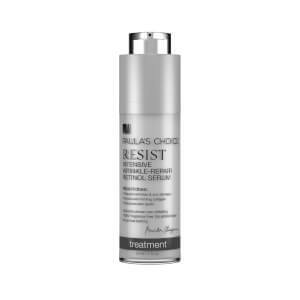 Infused with a host of beneficial ingredients, including Niacinamide, Shea Butter and Liquorice, the antioxidant-rich cream absorbs quickly to help target premature signs of aging and improve the skin's overall appearance. 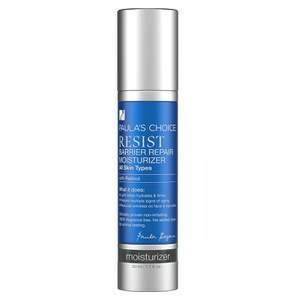 Provides broad spectrum UVA/UVB protection and defends against environmental aggressors, whilst delivering optimum levels of moisture and hydration without greasy residue. Skin looks smoother and brighter with a soft, dewy finish. Fragrance free. Not tested on animals. Aqua, Ethylhexyl Methoxycinnamate (Octinoxate 7.5%, sunscreen), Homosalate (5%, sunscreen), Ethylhexyl Salicylate (Octisalate 5%, sunscreen), Benzophenone-3 (Oxybenzone 5%, sunscreen), Silica (opacifier and texture enhancer), Glycerin (hydration), Butyl Methoxydibenzoylmethane (Avobenzone 3.0 %, sunscreen), Cetearyl Alcohol (texture enhancer), Dimethicone (hydration), Butylene Glycol (hydration), Pentylene Glycol (hydration), Potassium Cetyl Phosphate (emulsifier), Cyclopentasiloxane (hydration), Pyrus Malus (Apple) Fruit Extract (skin-restoring), VP/Eicosene Copolymer (texture enhancer), Butyrospermum Parkii (Shea) Butter (emollient), Allantoin (skin soothing), Niacinamide (skin-restoring), Tocopherol (vitamin E/antioxidant), Glycyrrhiza Glabra (Licorice) Root Extract (skin soothing), Aloe Barbadensis Leaf Extract (hydration, soothing), Atractylodes Macrocephala Root Powder (antioxidant), Avena Sativa (Oat) Kernel Extract (skin soothing), Coffea Arabica (Coffee) Seed Extract (antioxidant), Portulaca Oleracea Extract (antioxidant), Mahonia Aquifolium Root Extract (antioxidant), Diethylhexyl Syringylidenemalonate (antioxidant), Sarcosine (skin softener), Capryloyl Glycine (skin softener), Maltooligosyl Glucoside (skin softener), Cetearyl Glucoside (skin softener), Dimethiconol (texture enhancer), Acrylates/C10-30 Alkyl Acrylate Crosspolymer (stabilizer), Hydrogenated Starch Hydrolysate (hydration), Hexylene Glycol (texture enhancer), 4-T-Butylcyclohexanol (emollient), Glyceryl Stearate (texture enhancer), PEG-100 Stearate (texture enhancer), Sodium Hydroxide (pH adjuster), Xanthan Gum (stabilizer), Disodium EDTA (chelating agent), Phenoxyethanol (preservative), Caprylyl Glycol (preservative), Ethylhexylglycerin (skin softening).